YouGov | Being a mum is never easy. Over half of the APAC respondents think it is even harder today! on May 17, 2017, 6:02 p.m. Gender equality and women’s empowerment has been encouraged for decades. As society changes, we see more and more women holding senior positions in companies, acting as CEOs and as heads of government in a number of countries across the world. However, has the role of women at home changed too? YouGov, the world’s leading online research firm, polled over 9,000 people across 8 countries in Asia Pacific* to investigate what people think about a woman’s role at work and at home today. When asked if they approve of a married woman holding a job in business or industry if her husband is able to financially support her and the whole family, majority of APAC respondents (77%) approve. Hong Kong has the highest approval rate of 83%. Other APAC countries have similar levels of approval (from 76% in Malaysia), except for Indonesia, where only 55% of respondents approve. Unsurprisingly, more female respondents (80%) than male respondents (74%) approve of married women working even without financial burden. Young people of working age (aged 25-34) are the most likely of all age groups to agree, with 79% of respondents approving. When it comes to raising children, opinion changes however. Seven in ten respondents (69%) think children are better off if their mothers are at home. The percentage is the highest in Indonesia, where almost four in five respondents (79%) think children are better off if their mothers are home and don’t hold a job. Interestingly, this is a dominant view across all age groups, marital status, working status, income level and education level in all APAC countries interviewed. Nowadays many women have more than one role. 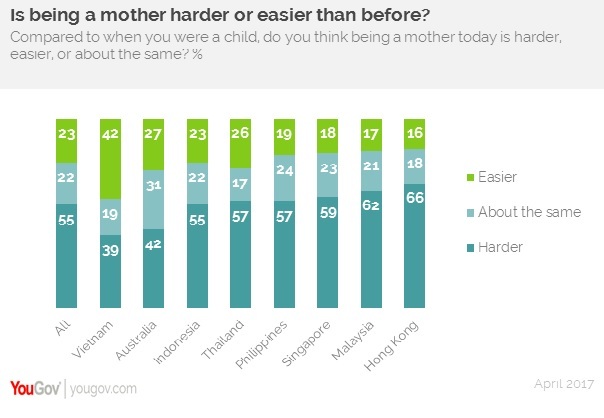 Perhaps because of this, over half of APAC respondents (55%) think being a mother today is harder compared with being a mother during their childhood. The view varies a lot in the region, however. Hong Kong are most likely to agree that being a mother today is harder (with 66% of respondents think so); however, less than 40% of people in Vietnam think the same. Again, more female respondents (58%) than male (52%) think being a mother today is harder. When we look at employment status, those who are working (57%) also tend to think being a mother today is harder, compared with those who are not working (51%). Only 23% of APAC respondents think being a mother today is easier, with the remaining 22% think it is about the same.